OnePlus 5 smartphone is available for 10 percent off under the Student Program. So, the students those who all studying or yet to finish their college in this academic year can get 10 percent offer exclusively. UK, Germany, France, Italy, Spain, Netherlands, Denmark, Sweden, Finland, Austria, Belgium, Portugal, Poland, Slovenia, Czech Republic, Croatia, Hungary, USA, and Canada. There are three assignments which given by the OnePlus to students who like to buy OnePlus 5. So, those students should pass the three simple exam to enjoy the exclusive Students Program offers. By this test, it will be confirmed the the opportunity to acquire the OnePlus 5. Then, verify your student account to access the Student Program. The second step which makes you will be eligible to claim your coupon worth 10 percent discount on OnePlus smartphones. Just hit the claim button to get your 10% off coupon. From the next purchase, you can able to use the coupon code during this month. Read the official Terms and conditions to avail this offer on the official article by OnePlus. 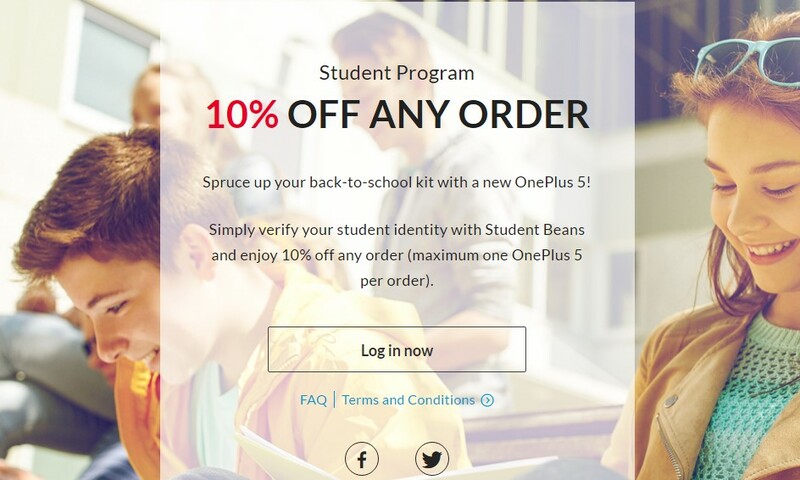 Note: Limited offers only for OnePlus5, can also purchase any other mobile phones of OnePlus by using the Student program coupon code.